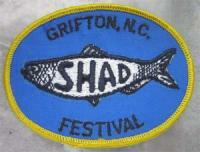 The Shad Festival at Grifton was started in 1971 as a way to promote community spirit and attract visitors to eastern North Carolina. The weekend festival, held each April, celebrates the annual migration of shad up the Neuse River and into creeks such as the Contentnea, which bisects Grifton and once brought steamboats to the town. The Shad Festival boasts more than 30 events, which include a beauty pageant, a "Fishy Tales" lying contest, an art show, "Shad-O" bingo, canoe and kayak races, the "Shad Shoot" archery tournament, a street dance, and plenty of music. The kick-off event for the festival is a shad fishing contest, the winners of which have set four state records for hickory shad taken on hook and line. A parade proceeds down Queen Street, where visitors can also find crafts, a flea market, entertainment, and food. Those who ride the "Shad Shuttle" to the Historical Museum may be surprised to learn that just north of Grifton was the fortified Tuscarora town, Catechna, site of an important battle in 1712. Chief Arnold Hewitt of the Tuscarora Indian Nation in New York came to the 1977 Shad Festival as a special guest. Because shad is so bony, not much of the fish is actually eaten at the Shad Festival, and other kinds of fish are used for the festival's fish fry and famous fish stew. Eastern North Carolina barbecue is another popular item on the menu. Jerry Bledsoe, North Carolina Curiosities (1990). Janet Haseley and Ed Haseley, eds., The Twenty-seventh Annual Grifton Shad Festival Handbook (1997). [Oval patch, Grifton, N.C. Shad Festival]. Item H.2013.25.6, North Carolina Museum of History. (accessed December 22, 2014).